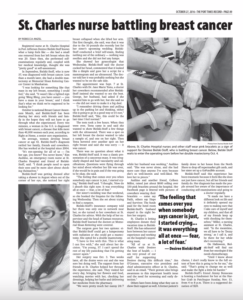 The Port Times Record published this piece in print on Oct. 27, 2016. 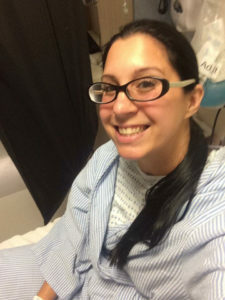 Registered nurse Desiree Bielski-Stoff knows what a lump feels like — she had a small one removed from her left breast when she was 20. Since then, she performed self-examinations regularly and, coupled with her medical knowledge, thought she was “pretty good” at self-assessment. Bielski-Stoff waits to enter the operating room before her double mastectomy Oct. 4. Photo from Bielski-Stoff. Bielski-Stoff found out on Halloween she will need four months of chemotherapy. 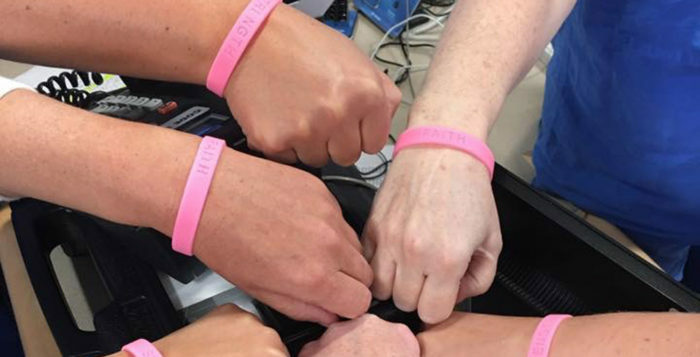 St. Charles Hospital nurses and other staff wear pink bracelets as a sign of support for Desiree Bielski-Stoff, who is battling breast cancer. Photo from Bielski-Stoff.